Size matters. At least when it comes to Deadpool's team. IMAX has unveiled this awesome new poster for the upcoming Deadpool movie, starring Ryan Reynolds as the fourth-wall-breakin' Merc with a Mouth. 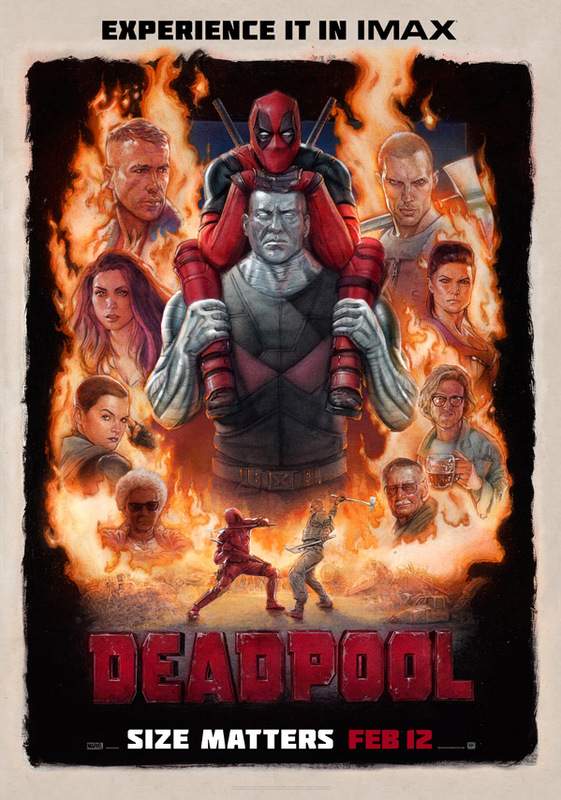 The marketing for this movie has been absolutely brilliant, fully embracing the mock-everything attitude of Deadpool himself. This IMAX poster (and a short new trailer below) continues to follow that trend by going overboard on absurdity and mockery, and it's perfect. I can't think of any other movie or character that this poster would work for, and it's crazy they actually approved this. Makes me look forward to this even more. Really? None of the footage has grabbed your interest? I love the fourth-wall stuff, I love that they're embracing the fact that Deadpool is making fun of all the other comic book characters. It's going to be fun. I love the Merc with the Mouth....the comics are unique, and his random appearances in other Marvel comics are always out of left field, but I'm not getting the same 4th wall-busting vibe I get from the comics....so far, it seems like more of the same from Fox.... I'm still super curious to see it though....but I'm not 100% sold. Hey, it's still gotta be better than Fantastic Four, right? "Don't make the super suit green...or animated!!" Yeah, I agree. I'm just bummed out they set up camp yet again in Vancouver. I mean, yeah, it works for the Apes movies, but not every movie Fox drops. Ha. Can't help that! Just the way the production biz works. Same with anything that shot in New Mexico or Detroit the last few years. Production incentives are top priority. Same. I love the idea of a hyperviolent comic book movie/parody but all the humor strikes me like im watching an episode of Family Guy. In a bad way. "Ah! You gave the tall man some flowers." Why does Deadpool strike me as gay? The poster from before and now this. Glad to see Colossus having some screen time, he was one of my fav X-Men characters. The Joker is the dark side of bugs bunny. Dead pool is the light side of Bugs Bunny's dark side. And if that made sense to you, then I wish you'd exthplain it to me thometime buthter. Love this! What a way to show love to Star Wars and being awesome.